Yeats's "A Dream of Death" begins, "I dreamt that one had died in a strange place/Near no accustomed land/And they had nailed the boards above her face/The Peasants of that land... ." And Coleridge "In Xanadu did Kubla Khan/a pleasure-dome decree" reads like an opium induced dream--which it was. But most dreams are more prosaic and of more of interest to the dreamer than anyone else. That's why dream interpretation is sometimes better left to prophets than practitioners of psychotherapy. 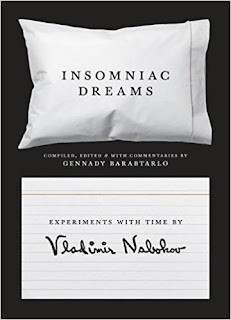 In his review of Vladimir Nabokov's Insomniac Dreams: Experiments with Time (TLS, 2/23/18), compiled and edited with commentary by Gennady Barabtarlo, Eric Naiman describes an undertaking of almost biblical dimensions in which Nabokov, influenced by a work called An Experiment with Time by John W. Dunne (who turned out to be an aviation engineer no less), sought to prove that dreams were prescient. Says Naiman, "The practice of Dunne's experiment had the added advantage of dethroning the reigning Freudian paradigm of dream analysis, though conceivably it might also have led to a new version of psychoanalysis, aimed at discerning future traumas in current symptoms." Naiman employs the word "fatidic" in his review. Considering who was doing the dreaming, the reader will likely find more of universal significance in the dreams of the author of Pale Fire than in the average person's oneiric experience.